Rajasthan Royals rode their bowlers' good show coupled with skipper Ajinkya Rahane's 45 to beat Delhi Daredevils by 10 runs via Duckworth-Lewis Method in a heavily rain-truncated Indian Premier League (IPL) clash here at the Sawai Mansingh Stadium on Wednesday.The IPL returned to the Pink City after 2013 but rain played spoilsport for the major part, forcing D/L method to come into play after the hosts were 153/5 in 17.5 overs when it started drizzling.Delhi were given a revised target of 71 to chase in six overs but Australian pacer Ben Laughlin (2/20) picked up the wickets of Glenn Maxwell (17) and Vijay Shankar while Jaydev Unadkat (1/24) accounted for Rishabh Pant (20) to never let Delhi come close to winning in harsh circumstances.Opener Colin Munro (0) was run out without facing a ball. Chris Morris (17 not out) and Shreyas Iyer (0 not out) were at the crease.Earlier, Rajasthan rode Rahane's 45 to get to 153/5 when the skied opened up in the 17th over with Rahul Tripathi (15) and Krishnappa Gowtham (2) at the crease.For Delhi, left-arm spinner Shahbaz Nadeem returned best figures of 2/34 while New Zealand pacer Trent Boult and India fast bowler Mohammed Shami also picked up a wicket apiece. 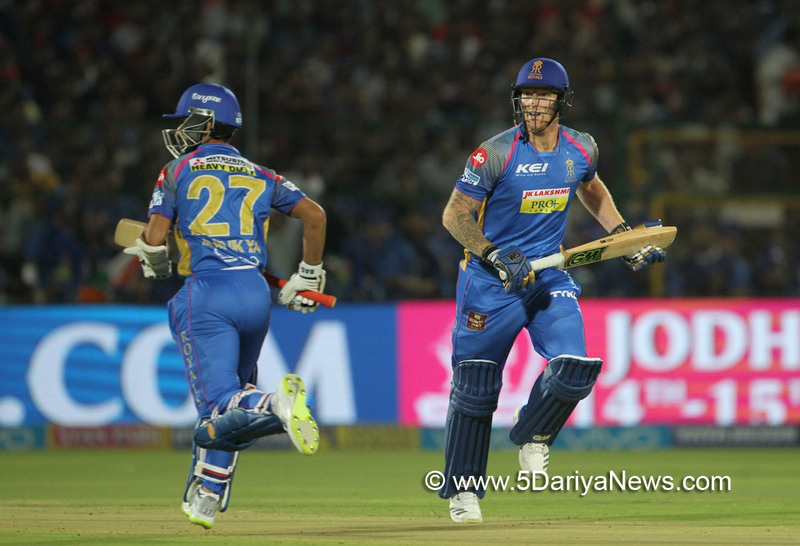 Rahane stitched together a 62-run stand with Sanju Samson (37) for the third wicket while wicketkeeper Jos Buttler (29) and Tripathi joined hands for another important partnership of 38 runs for the fifth wicket.Rajasthan lost opener D'Arcy Short (6) early to a run out and then Trent Boult got the outside edge of star England all-rounder Ben Stokes (16) for keeper Pant to take an easy catch.Nadeem castled Samson to bring an end to his association with Rahane, scalping the captain's wicket also with a away-turning delivery which the batsman tried to work over midwicket but have a catch to Chris Morris at point.Buttler was removed by Shami just when the England stumper was looking good to go big before rain interrupted play.Brief scores: Rajasthan Royals 153/5 in 17.5 overs (Ajinkya Rahane 45, Sanju Samson 37; Shahbaz Nadeem 2/34) beat Delhi Daredevils 60/4 (Rishabh Pant 20; Ben Laughlin 2/20) by 10 runs via D/L method.